Last month, we announced an exciting new collaboration between Vibe Coworks and one of Kitsap's newest preschools: Magnolia Forest Preschool. Easier access to affordable, quality early childhood education is at the forefront of many Vibe families, and we're thrilled that discounted tuition at Magnolia is now included among the many benefits of being a Vibe member. Brandyn Boyd and Jenny Stokes founded Magnolia Forest Preschool to provide Kitsap area families with an innovative education approach to outdoor play and learning. In case you haven't noticed, though, we're big on real, authentic human stories about the people who make up our greater Kitsap community. Lucky for all of us, that community includes Magnolia Forest School founders and educators, Jenny Stokes and Brandyn Boyd. Think we'd miss the chance to sit down and get to know them? Of course not. So pull up a seat and join us in going behind the scenes with Jenny and Brandyn, two of the West Sound's leading forest school educators. When did you move to Poulsbo, and why? Jenny: I moved to the PNW fourteen years ago when my, then, husband accepted a job as Executive VP of a community college in the area. I met the most genuine people I had ever met and decided that I wanted to raise my young family here. I have never regretted my decision. Brandyn: I moved to the Olympic Peninsula with my family ten years ago. This is where my mom grew up and it has always felt like a second home. We moved to Kitsap County in 2014 when my husband accepted a teaching position at Kingston High School. We absolutely love this area and are so happy to raise our three children here. Where were you born / did you grow up? Jenny: I was born in a small Arkansas town and had the fortune of going to kindergarten in a college town that was quite progressive for the 70s in its approach to education. Much of my early childhood education was centered around how we, at Magnolia, understand to be the way children learn and construct knowledge, which is through play. Brandyn: I was born and raised in Northern Virginia. I had a mixture of private and homeschool education. My mother gave me countless opportunities to be creative, taught me to sew and even let me raise a menagerie of pets. I grew up training at a serious ballet studio and spent most of my free time pursuing that passion. We came back to the Olympic Peninsula every summer for a month to stay with my grandparents, ride horses and relax. At that time, I never dreamed I would move there someday with my own family. What inspired you to pursue a career in education? What was that ‘ah-ha’ moment when you knew this was something that you felt really passionate about? Jenny: I come for a long line of educators and cannot remember a time when pedagogy was not a topic of conversation at any family function. I have taught many ages, but it was not until I began teaching preschool that my passion and conviction to provide children with a program rich in play and experiences was ignited. Brandyn: I have always found myself in a teaching role, although these have varied over the years from pretend play with my school friends, leading my peers at youth group, and pursuing an elementary education degree in college. I am most passionate about the process and pedagogy of teaching, understanding the mind of the learner. I absolutely love teaching early childhood students because their instincts to learn are so pure and unadulterated by other’s expectations. If we can nourish the seeds within them during their first years of school, I believe the impact is exponential. As humans, as educators and as a business leaders, how does the environment that you’re working in impact you and the work that you do? Jenny: The environment I'm in plays an integral role in what I do: my productivity, joy, and creativity. Whoever decided that children should be placed in a room inundated with primary colors, cartoon figures and other cliches of childhood has done a huge disservice. I think we all do better in an environment that is calm, comfortable and free of clutter. A place that allows your mind to think. The outdoors is the ideal place to become centered, and I believe we would all be a lot happier, healthier and more productive if we spent more time outside. Brandyn: I've learned through various job experiences that a healthy work environment massively impacts my emotional and mental capacity to grow and birth new things. I am so happy to be on this journey to establish a new school in Kitsap County. We will be able to establish a healthy work environment for our employees and give them a wonderful platform from which to grow professionally. It is so important that work culture is collaborative, honoring and transparent. As educators, we can always improve. Having this perspective creates a work environment that we can look forward to each day and be proud to belong to. Tell us about your 'why': Why Magnolia? Why forest school? Why Poulsbo? Why now? Jenny: The name “Magnolia” comes from my brother’s youngest child, Magnolia. My brother, who has a PhD. in Early Childhood Education, has been an invaluable resource in the development of what we now call Magnolia Forest Preschool. We believe that the forest provides room for children to fully explore the people they are meant to be. It also provides the opportunity for them to be fully engaged in both sociodramatic (pretending) and constructive play (building or making things). Poulsbo is becoming home to many new families, and we saw this as an opportunity to develop a school that is different than the ones we know to be in this area. Parents are sophisticated, smart and value an education that provides more than being able to parrot facts. They appreciate problem-solving, critical thinking, creativity and cooperation—all skills needed to be successful in the twenty-first-century marketplace. Brandyn: Forest preschool is an innovative education approach to outdoor play and learning. 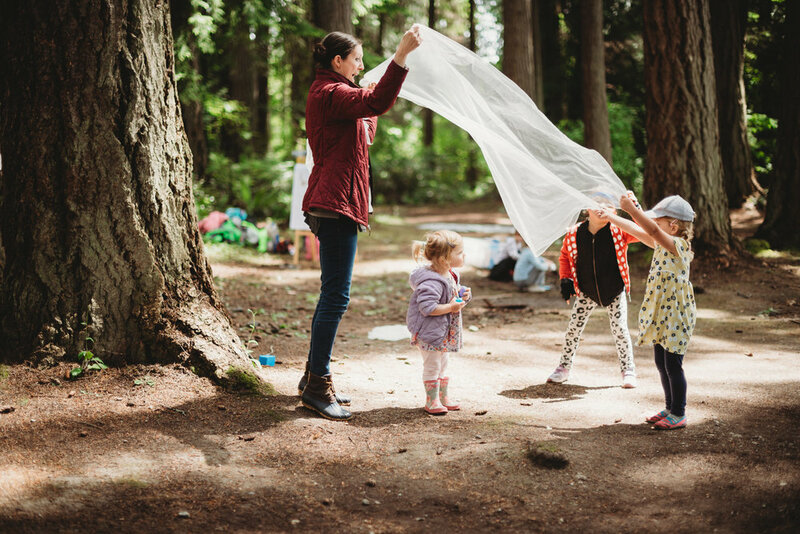 At forest preschool, children visit the same woodland on a regular basis and are given the freedom to play, opportunity to explore and learn about the natural environment, and support while learning how to handle risks, solve problems, and cooperate with their peers. Preschool runs all year, where children learn and play in the woods in all weathers: sun, rain, snow, warm and cold, (barring high winds or other extreme weather). As the forest is ever changing, each day brings new and different exploration opportunities. Children play, learn boundaries—both physical and social—grow in confidence, and become self-starters. The concept of “Forest school” is not a new one. The “forest school” movement, as we know it today, originated in Denmark and is based on the idea that young children can develop enthusiasm for education through an appreciation of nature. In Denmark, forest schools have boosted pupils' confidence and improved their behavior and social skills. Empirical research and writing in the field of young children’s play are burgeoning, with hundreds of recent articles in international journals and recent books underscoring the importance of play in early childhood education. Let's talk about entrepreneurship, as it relates to kids. Do you think the skills needed to be successful entrepreneurs are something that we all have naturally or is that something that is learned? Jenny: The skills fostered in an education that values play are precisely those that are needed to be successful entrepreneurs: critical thinking, curiosity, problem-solving, diligence, ingenuity, being able to negotiate and creativity to name a few. Many times, traditional schools “teach” these skill out of us. By only accepting “right” or “wrong” answers like those required for standardized tests, possibilities are taken away, and children become rigid in their thinking. A partnership between a coworking space and a preschool is probably a bit of a surprise to some people. What is it about this relationship that you’re most excited about? Brandyn: The partnership between Magnolia and Vibe is a perfect and logical fit. Vibe provides a place where adults can come and have the community atmosphere of a traditional workplace, many of whom are parents or young children while working on their own endeavors. We are social creatures and are more productive when we can inspire and be inspired by others. Children learn more from their peers than they can from an adult playmate. For kids, Magnolia is a break from the mundane, a place to leave their own mark and to have something of their own. Here at Vibe, we’re big advocates for helping local professionals work happier, healthier and more connected—helping people do the things that they love, both personally and professionally. What do you think the effect is for kids, when they see their parents succeeding in the things that they are passionate about? Jenny: When a child observes their mother or father “dreading” going to work because it is uninspiring, dull or seen only as a means to an end, they don't view work as something valuable—only necessary. Something separate from themselves. Conversely, when a child sees their parent passionate about their work, they see it as an endeavor that brings joy, inspiration and value—a part of who they are. We want our children to value their education, their work and their play, and they learn that from what they see modeled for them. How do you think Vibe Coworks will change the world of work for families Poulsbo and throughout Kitsap county? Brandyn: Vibe provides a place where synergy is possible. With synergy comes the creation of something greater than any one person can achieve. It infuses its members with confidence that what they have to offer is important. We all need the strength of community to go beyond our comfort zones, to create, and to bring new concepts to life. Vibe provides the community with highly effective members who can create positive change for Poulsbo and all of Kitsap County. What’s your hope for Vibe parents who also choose to become part of the Magnolia Forest School family? Magnolia: We hope that they see their children learning in an environment that fosters the same things they were looking for as adult creatives and professionals when they found Vibe Coworks. Russian philosopher, Lev Vygotsky, believed that knowledge is a social construct. Vygotsky's theories stress the fundamental role of social interaction in the development of cognition, as he felt strongly that community plays a central role in the process of "making meaning." Play-centered programs promote equity because they are built around the strengths of young children rather than their weaknesses. We expect Vibe parents and Magnolia kids will be able to share in the journey of trying new ventures, with an understanding that there is joy in the journey and we are stronger together. Jenny: I get a lump in my throat daily when I see a child have an “ah-ha” moment—when everything comes together for that child and they have the feeling of accomplishing something by themselves. You cannot get that when a teacher is looming over her students telling them what to learn, when and how to learn it and why it is important (to them) to learn it. When I see a child, through trial and error, diligence and hard work, do something they have never been able to do before, that moment—that is pure joy to me. Brandyn: I greatly enjoy helping parents face the preschool years with confidence. This phase in a child’s life brings all sorts of questions and challenges. As an educator, I absolutely love partnering with parents to bring understanding, success stories and problem-solving strategies. Navigating a young child’s development is a collaborative effort, unique to each child. I find a lot of fulfillment knowing that parents of my students can see them becoming fuller, confident individuals. I love fostering an environment where that deeper work is taking place. This is education that affects their future. Talk to us about the families you serve. Are there any favorite stories you can share? Jenny: I have one little boy who is very precocious and often misunderstood, as clever and gifted children often are. We were walking to catch up with the group, and he leaned over and picked a flower and handed it to me. I asked, “is this for me?” He said sincerely, “Yes, because you’re my biggest fan.” I answered, “I sure am.” That’s how it should be. All children should feel valued and celebrated for their strengths. If I can do that as a teacher, I have done my job. Brandyn: One of my favorite memories is of a sweet, shy little girl who transformed into a confident, silly, story-telling friend of many last year. She used to wait on the sidelines, and then come very close to me to whisper her important words. But, by the end of the year, she was free to be herself and was full of joy amongst her peers. Personally, I was very shy as a child, so I have a tender place in my heart for children like her. I’m so glad that the learning environment at Magnolia nourishes students’ self-esteem so much that we can see big transformations like these. What’s one piece of advice that you would offer to new families moving to Kitsap? Brandyn: Trust that you will find your “people”. There are so many wonderful young families in the area. It can be daunting to restart in an new place, but rest assured that as you and your children settle in, you will find people seeking friendship, just like you. All photos by Stand in the Sun Photography.